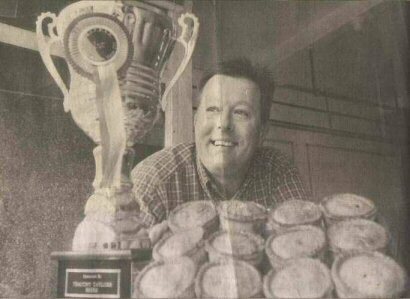 Award winning pork pie maker Andrew Jones pictured at his shop, AR Jones Butchers, in Brighouse. was crowned champion pork pie producer for the third time on Saturday. Mr Jones came out top from 51 entrants to the 10th annual pork pie competition at the Old Bridge Inn, Ripponden, near Halifax. The annual contest was being revived after the foot-and-mouth crisis forced its cancellation last year. Butchers from around the county were joined by entrants from Bakewell in Derbyshire to battle it out for the coveted title. Following three elimination rounds of blind tasting, Mr Jones was judged the winner, taking the title for the third time in 10 contests. He said: "1 am absolutely flabbergasted. I have gone back to basics with this pie, using an origi-nal recipe and just keeping it simple. Taking the trophy is a big boost to trade and I have opened another shop in Brighouse in the last 12 months." The contest was judged by a panel which included celebrity chef Brian Turner, who returned to his Yorkshire roots on Saturday to sample scores of pork pies and pick a winner. Turner, who was brought up in Morley, near Leeds, said the key to a prize-winning pork pie lay in a combination of things. "It needs a tasty meat, a good jelly, a good, crunchy pie crust, and when you finish eating it, you would say, 'That was grand'." The event raised £600 for the Jonathan Haigh Trust, set up by colleagues of the 22-year-old Calderdale lifeguard who broke his neck in a ski-ing accident last year. Mr Haigh is paralysed from the neck down and the fund aims to raise £18,000 to provide him with a hi-tech wheelchair.